This year’s Turning Man is going to spin end to end. Bells are going to ring out every hour, and then the Man will be rotated like clockwork. The area around the base is going to be used for skills training workshops. 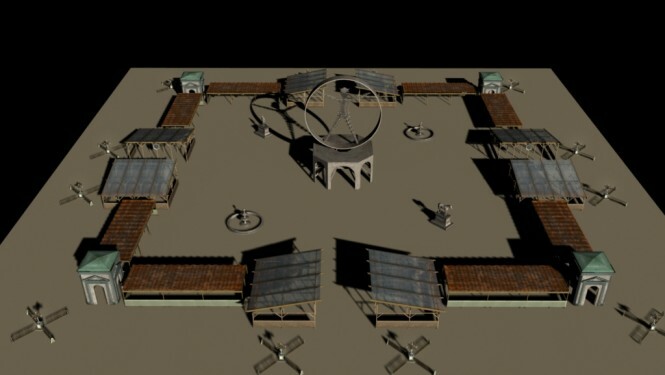 In contrast to the historic squares of Florence that serve as its inspiration, Black Rock City’s piazza will be a playfully détourned version, re-imagined for our desert milieu through the use of repurposed, reused, and recycled materials. It will be anchored at its corners by four campaniles or bell towers, and flanked by four rows of Workshops, sheltered spaces intended for the teaching, learning, and practical application of art and craft. Encouraged by the community’s positive reaction to the Souk in 2014 and the Midway in 2015, we designed these Workshops as the latest step in our ongoing experiment to turn the area around the base of the Man into a rich interactive space. To that end, we will be calling on artists, craftspeople, and tinkerers from across the Regional Network and beyond to help turn these Workshops into lively centers of creative activity, and have set aside a portion of our Honorarium Art Grant budget to help bring these ideas to life. Complementary groups will be encouraged to collaborate here as they do so frequently in their home communities, pulling together artist, organizer, and maker resources to fashion an updated version of the guild network …The emphasis within the Workshop spaces will be on experiential learning through hands-on doing…in order to turn the fruits of one’s imagination into action in the world, new skills often need to be acquired. Whether it’s as ancient as sewing or weaving, or as modern as programming digital lighting arrays, Burners enthusiastically embrace new skills to make their art installations, theme camps, or other projects bigger and better. It’s not live entertainment, it’s lively centers of creative activity. Some people go for the EDM and molly, some for the sewing lessons. Perhaps the Ministry of Propaganda will be conducting some spin classes. So what happens when The Man burns? Everyone crowds inside the square plaza? Where are the art cars going to go?